This is the first time I’ve used fresh fruit (other than applesauce) in biscotti, and, the infusion of strawberry flavor is so, so good. Cooking down the strawberries to a thick, jam-like mixture worked perfectly, and it is always a good match for toasted almonds and sweet chocolate chips. Put the strawberries and water in a small saucepan, bring to medium heat, then cook, mashing with a fork as they get soft, for about 20 minutes. The mixture should be thick like jam. Transfer the mixture to a small food processor or blender and puree until smooth. You want 1/2 cup (120mL) total. If it is more than 1/2 cup, continue cooking on medium heat until 1/2 cup is reached. Stir in the flaxseed and let cool to room temperature. Put the sorghum flour, arrowroot flour, quinoa flour, xanthan gum, baking powder, and salt in a small bowl. Whisk until combined. Put the sugar, coconut oil, and vanilla extract in a stand mixer. Beat until smooth and well combined. Add the strawberry mixture. Beat until combined. Turn the mixer to low speed. Gradually add the flour mixture to the sugar mixture, beating until well mixed. The dough will be stiff. Use your hands to knead in the almonds and chocolate chips. Transfer the dough to the baking sheet. Using lightly floured hands, form it into two logs, each about 8 x 3-inches. Bake for 25 minutes, until firm to the touch but not hard. Let cool on the baking sheet for 10 minutes. Decrease the oven to 300F. Cut each log into 3/4-inch slices using a sharp knife—do not saw. Remove the parchment paper from the baking sheet. Put the slices on one side, cut-side down, and bake for 10 minutes. Turn the slices onto the other side and bake for 5 to 10 minutes, until toasted and firm. Transfer to a cooling rack to cool completely. 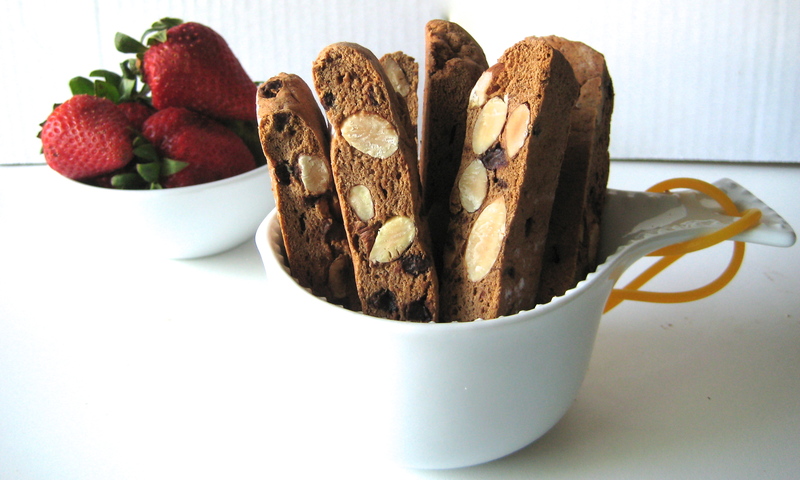 The biscotti will continue to harden after they have cooled.